This is a novel in the guise of a classic 'whodunit'. It's a story about what makes us human and about how we bring both love and pain to our family relationships. 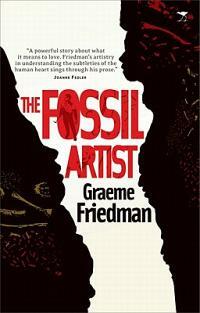 Fossil artist weaves matters of the heart and mind into a compelling story of one family, which traverses time and place, from the East End of London in the early 1900s to great archaeological sites in Africa. Powerful insights into the evolution of the human soul, of our expression of love and war, and of art and language, all emerge in this great story of our constant search for personal understanding. Russ Codron, a well-meaning optician, has dark secrets that not even his wife has been able to dig out of him. But when he is confronted with the mummified remains of his fossil-hunter father, in the pages of the Sunday Times, the chaos of his past crashes into the stability of his present. Needing desperately to find out what really happened to his father, he begins a quest that will lead him to the very core of the biggest scientific fraud of all time – the forgery of the Piltdown Man fossils – and to a discovery what it really means to be able to love. I did enjoy this book, I guess because it combined so many different things I like to read about: Mummies, Fossils and Archaeology, Autism and plus, it was set locally which is always pretty cool :) The story is not an amazing wow or twisty-turny, it's just an interesting story of one fictional guy's (and I hesitate to use the word) journey to the truth. Anyway, I liked it. And I think The Peeb might too. Maybe like is too strong a word. I was interested to read it and I'm glad I did. Does that make sense?